Joshua Boehm is an intergalactic spy, loner, womanizer, Dead Head, and a recovering addict. He loves his job, but he also wants something more; the truth and a normal life. Successfully completing his latest mission, Joshua is informed of The Teapar Coalition, a sinister organisation of individuals who plan to take over the galaxy by pillaging planets of their natural resources and the general corruption of the Galactic Senate. After a discussion with the leaders of The Progressive Alliance, a group determined to stop The Coalition at all costs, Joshua is undecided about whom he can trust. Meeting the mysterious Myrra Nirvan, first in a dream, and then in person, Joshua comes to understand that she is the key to defeating the enemy. They become lovers and join forces in an effort to defeat the Coalition. Fighting against enemy after enemy, it quickly becomes the most demanding mission of Joshua’s career. With help from a trinity of spirit guides from Myrra’s home planet, a spiritual transformation, and a quirky team made up of Joshua's and Myrra's friends, Joshua comes to the conclusion that he must make the choice of continuing to fight violence with violence, or to adopt a more peaceful approach to the problems of the Galaxy. 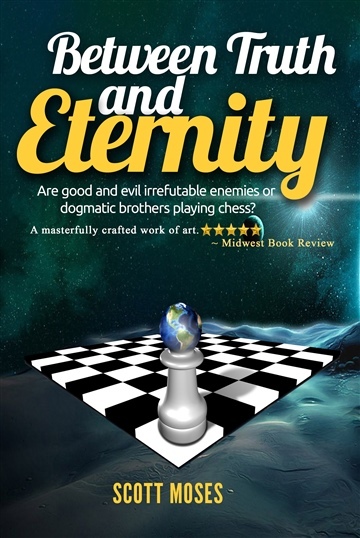 "In the novel “Between Truth and Eternity”, Scott Moses creates a captivating futuristic world eerily similar to the present, making the book hard to put it down once started, due to its unpredictable situations. I would recommend it to every Science-Fiction/Fantasy fan!" "Between Truth and Eternity will keep you on the edge of your seat. The pacing is steady with great character development and insight. A must read." "Between Truth and Eternity is full of emotions and drama directed towards the search for truth but does not preach to the readers what should be right and wrong. These elements make it a must read for all fiction lovers."